The days of video learning equating to dimming the classroom lights and popping a VHS tape into a player are over. When someone wants know-how about anything, most people are now quite comfortable turning to internet searches and watching videos. E-learning programs can be enhanced with video, adding dimension to your learning and development programs, but it’s not as simple as linking to a 30 minute video and letting the content do all the instruction. Keep it short. Consider the length of the video. If it’s too long you will lose the attention of the learner. You cannot expect deep attention from video alone. Stay focused on the point to keep learners attention. When kept short and focused, video can easily demonstrate a concept. Learners cannot control the pace of video, so you need to supply controls to pause and replay video within the course. Video content should only be key points of information (see my previous post on microlearning https://tinyurl.com/kxgbm3n) to be easily comprehended, and of interest to learners. Reinforce the video content by engaging the learner in knowledge check questions, and other e-learning instruction methods. What about oil and gas learners? 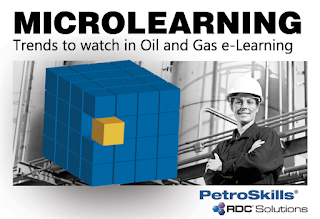 Oil and gas learners are often covering complex technical information. They need sound instructional design and verification of knowledge transfer. Organizations can’t rely solely on video, but can use some benefits of video to enhance e-learning. Short focused video can make e-learning more media rich and engaging, but videos can also be boring and lose the interest of learners if they are not combined with interactive content. Interactivity makes learners focus, think, analyze, and take part in the instruction. Presenting objectives and tying meaningful questions to the video topics with knowledge check questions keeps learners involved. Repeatability is good for comprehension. Video can refresh and reinforces previous learning. Different learning styles can be addressed by repeating instruction in different formats. Visual learners and poor readers my find video enhanced courses allow them to connect visual information to what they read and recall, thus reinforcing information. 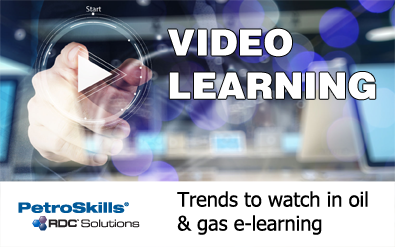 Video simulations show processes and prepare learners for actual use of equipment beforehand. If you would like to know more about making impactful eLearning, helping your learners to engage with the content, why not drop us a line at solutions@petroskills.com. Or visit www.petroskills.com/elearning. Microlearning is a short, focused learning chunk designed to deliver content that will quickly close a skill or knowledge gap. E-Learning that is chunked down to bite-sized learning can be easily consumed and understood by learners. How do you implement microlearning in your e-learning curriculum? The key to the microlearning approach is the breakdown of required job knowledge into its smallest logical requirements. Each job role has specific knowledge that is required for proficiency. Once the knowledge requirements for each job role has been defined, a proven instructional design methodology is used to break down the educational material into chunks that contain all information for a specific learning goal, or terminal objective. The resulting chunks of information are now modules or “microcourses”. Each microcourse focuses one small learning goal or terminal objective. This is the lasting useful knowledge that the learner will have acquired after completing the microcourse. Microcourses become the building blocks and when arranged in sequence or logical groups create a complete training curriculum. The learner launches a training course following the prescribed sequence. Each course presents the material (microcourses) in a logical and progressive order. In addition to ensuring that each and every learning objective is specifically addressed, logical assessments are incorporated into the content with in lesson “check your knowledge” questions and a final assessment to ensure each objective is met. Learners actively participate in the learning process with knowledge verification assessment for each objective. Additionally, microcourses can be automatically combined and recombined in real-time with other microcourses to form truly unique personal learning paths (https://tinyurl.com/jyp4zue). So that learning content is pulled by the learner’s need, instead of being pushed by a static “one-size-fits-all” curriculum. Microcourses add to the flexibility of e-learning access, allowing users to have anytime/anywhere access to learning and even in limited time frames (Please see our previous articles “Closing the Gap”). The pace and timing of microlearning activities are important. Adult learners on-the-job need quick access to timely instruction. Breaking down technical topics into small modules with short time requirements enables learning activities to be incorporated into daily routines and tasks. Learners are in control of what and when they’re learning. And the rich media formats in e-learning ensure better learning retention. Our course planning processes follow the extensive quality standards set by IACET. Each series is planned in advance, including the module, the terminal objective, the lesson, lesson topic, graphic asset requirements, evaluation requirements, and source material. Following proven instructional system design principles each topic is distilled into learning modules that work together in sequence to provide effective learning solutions. Our modules facilitate site, unit and job-specific customization to meet the mandated specificity requirements and the unique requirements of each job. Pre-tests, post-tests, and in lesson knowledge checks verify that learning is taking place. For more information on our approach, please visit our website. Microcourse. A microcourse is the smallest reusable learning element and contains all the instructional material to insure proficiency of a specific Terminal Objective. Developed using an accredited instructional system design methodology, it is the foundation building block in creating a learner’s Personal Learning Path. Lesson. A Lesson is a small unit of learning content designed to transfer knowledge for a single Learning Objective. Each Lesson consists of a combination of multiple learning frames, learner interactions, review questions and learning assets. Lessons covering related material are grouped together in a specific order for presentation to the learner in a microcourse. Lesson Topic. A lesson topic is a learning component that assists in knowledge transfer at the lesson level. Lesson topics are tied to evaluation requirements, where each topic will be validly and reliably assessed to ensure knowledge transfer occurred. Terminal Objective. A Terminal Objective is the statement of the learning goal for a Microcourse and represents the lasting useful knowledge that the learner will have acquired after completing a microcourse. Learning Objective. A Learning Objective (also referred to as an Enabling Objective) is the statement of the learning goal for a Lesson. Together, the combined Learning Objectives for all the microcourse Lessons address the overall Terminal Objective. Evaluation Requirements. Evaluation requirements are tied to lesson topics. Each topic must be evaluated to ensure that knowledge was transferred, and if not, provide the appropriate remediation.